This morning, the grouping of local political party representatives known as the Junta de Portaveus gathered with Formentera Council president Jaume Ferrer to discuss last week's meeting of the Formentera Council of Entities. Wednesday, 17 February, members of the local business community and different island organisations convened an evening gathering to discuss the location of the new Formentera landing in the port of Eivissa. That evening, meeting attendees unanimously rejected the Balearic port authority's proposed relocation of the landing to Eivissa's commercial dock. In a joint press conference, Ferrer announced the Junta's decision to request a meeting attended by Juan Gual de Torrella, president of the Balearic port authority, CiF president Ferrer, Formentera's party spokespeople and representatives of the two Eivissa administrations (the Council and the Ajuntament), «to open up new dialogue – with all the involved parties – on the relocation of the Formentera landing». In so doing, the Formentera representatives have taken up Gual de Torrella on an offer he extended at the Wednesday gathering to «meet with all the sectors affected by the relocation plans». After the meeting, Ferrer explained, «another gathering of the Council of Entities will be convened to report back». All those present at the Junta gathering indicated their support for the decision, and reiterated their insistence on keeping the Formentera landing in its current home. If a move is ultimately unavoidable, party reps said they want their suggestions – which include calling for a maximum number of services and accommodation for Formentera residents – to be heard before the port authority. 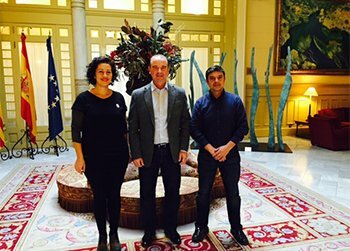 Formentera Council president Jaume Ferrer and councillor of social welfare Vanessa Parellada met today with the newly-appointed Moroccan consul for the Balearic Islands, Hanane Saadi, in the presidential office of the CiF. Ferrer thanked the representative of Morocco, whose 434 countrymen on Formentera he said «form a very important part of the island». Ferrer offered an outstretched hand to the newly-appointed consul and declared: «This administration does everything it can to meet the needs of our island's Moroccan community». For her part, the Moroccan consul gave thanks to Ferrer and Parellada for their welcome and used the opportunity to highlight the importance of education in assuring the proper integration of new generations of immigrants, who are Moroccan but also Spanish. 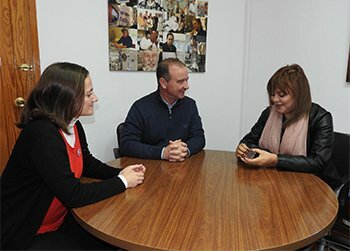 «Not until a person knows his origins can he integrate in his new home, and that is what is most important for us: the integration of Moroccans living in Spain». The Consulate General of Morocco in Palma opened four years ago, explained Saadi. The Moroccan representative assured «the Consulate General's mobile office will travel to the Pitiüsas up to twice a year to provide Moroccan residents here access to consular services». Earlier today, the CiF office of the presidential cabinet distributed navigational devices to the emergency response services participating in Formentera's code-based system to geolocate homes and strategic points across the island. The system will remain in trial stages through May, announced presidential office councillor Bartomeu Escandell, who added that «the first year is going to be largely experimental – Formentera is the first in the country to put in place such a system to quickly locate rural homes». The different emergency services forces received only a brief explanation of how to use the GPS devices; Escandell said that «in the coming weeks more thorough and personalised explanations will ensure their complete and correct use by the month of May». 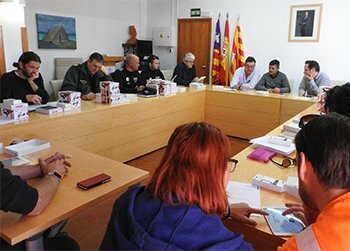 The twenty-five tracking tablets were handed out to members of civil protection services, the local police, Guardia Civil, Ibanat, the Formentera hospital, the Formentera fire brigade, social services and 061 services. «Using GPS technology», explained Escandell, «the emergency response services of the island will be able to locate the 3,600 homes that registered and received a code or any of the 800 different points of interest across the island». 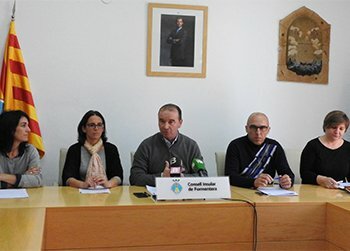 At a morning meeting of the Formentera Council (CiF) Junta de Portaveus, a group comprising one spokesperson from each political party with representation in the Council as well as CiF president Jaume Ferrer, members discussed the progress of priority projects set out in a special CiF document. The document, ratified at a Junta meeting in August 2015 and later in a plenary session of the CiF, sets out a list of different projects requiring action from the Govern Balear. In President Ferrer's words, the consensus-backed document gives credibility to the requests made by the CiF to the regional government in Palma. Ferrer added the Council's requests were «long-standing» and said the unanimity of the accord gives the local administration strength in its argument. 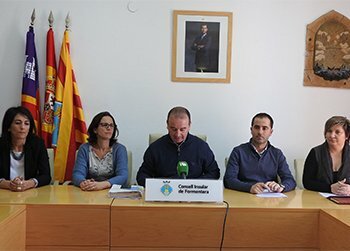 The meeting was a chance for members to speak about progress in the Formentera Council's relationship with the Palma government. As Ferrer pointed out, each of the 14 projects have been brought before the Govern (to the president or different regional ministers) because «they are either the direct responsibility of the Govern or require its intervention». Ferrer highlighted the Junta's unanimous decision to move forward with the different legislative projects and convene future meetings every six months or whenever there are important developments on an issue. In this way, he said, the Junta is sure to represent the support of the different groups with plenary representation. CiF president Ferrer thanked the different party spokespeople for their support of the document. CiF president Jaume Ferrer and Deputy Silvia Tur have issued their first joint valuation of the recent approval, by the Balearic Parlament, of the autonomous community's 2016 budget. The two officials agreed Parlament's new ledger includes consideration for the island of Formentera and improvements upon the version initially presented in November. On the trip to Palma Ferrer was also joined by Formentera's councillor of the presidential cabinet, Bartomeu Escandell. In addition to backing up Deputy Tur, the two men attended the debates and votes held on the matter. Ferrer congratulated Tur on striking a balance between her work for both the Formentera Council and Balearic Parlament, as well as “her ability to ensure improvements to the proposed budgets, whose initial renderings were unsatisfactory”. For her part, Tur heralded what she called “support for the issues Formentera puts forward” and “a will to engage in dialogue” on the part of the Govern's component political parties and Podemos. “The ensemble has made the completion of all our essential targets – indeed, the establishment of the 2016 pact – possible”. Tur said next year's budgets are underpinned by an understanding of basic social necessities and assistance that holds true to the Govern's promises at the start of this legislative sitting”. According to Ferrer, the definitive version of the budget contains improvements to the draft originally brought to Formentera on 9 November by the regional minister of the tax office and public administrations, Catalina Cladera, director general of budgets and financing, Joan Carrió. Ferrer added: “We were grateful to the Govern for coming to the island and explaining the proposed budgets - something the Partido Popular (PP), over the course of last legislative session, had never done. We also showed our appreciation for the Govern's efforts at finally making the new Sant Ferran school a reality. [The Govern] has included a €2.8-million budget line and plans to include another in 2017, putting their total financial commitment for the project at €3.7 million”. But the Sant Ferran school was not the only basic financing concern that Ferrer remembers voicing on that day. Ferrer points out that from the Palma representatives' November visit to today, “valuable work” between the Formentera Council and the island's deputy Tur has meant real improvements (including an additional €680,000 in funding) to the initially-floated version of the budget. Take, for instance, the increase in Formentera's endowment for interisland waste transfer from €300,000 to €550,000. Ferrer holds fast, nevertheless, on Formentera's request that the Govern ultimately assume 100% of the costs, stating: “It is unfair that Formentera residents should have to shoulder transport costs”. And then there is tourism, on which the Council and Councillor Alejandra Ferrer still hope to sign an agreement that will provide “fair and sufficient” funding to back the transfer of tourism promotions from the Govern Balear to the local island councils. The 2016 budget stipulates the Agència de Turisme Balear provide €300,000 to Formentera to help cover the Council's expenditures in tourism. Meanwhile, Deputy Tur reminded that in four years of the Bauzà government not one euro was put forth for this important issue. The deputy also praised the fact next year's budget includes €60,000 to unblock the start of operations at Formentera's irrigation pond as well as a €70,000 line item to go toward transport. President Ferrer and Deputy Tur indicated that after the holidays a press conference would be held locally to explain the Balearic community's 2016 budget in detail.